This is a really simple, powerful concept. 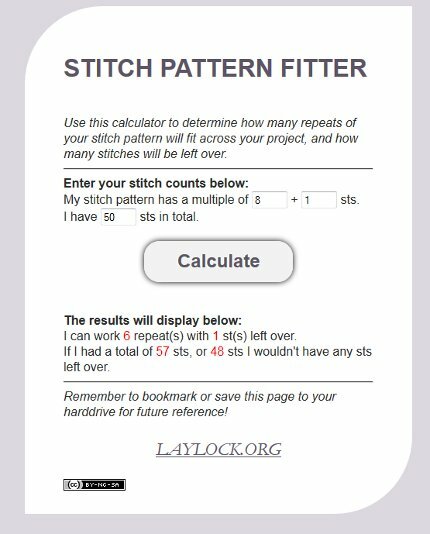 Just plug in the number of stitches the pattern repeat you want to use has and how many stitches you intend to cast on and it will tell you how many full repeats of the stitch pattern you can do and how many stitches you’ll have left over. To test it I put in a pattern (totally made up) with an 8 plus 1 stitch repeat. I suggested I had 50 stitches, and the calculator told me I could work 6 repeats and would have one stitch left over. Even better, it tells me I could use either 57 or 48 stitches and have no stitches left at the end, which is what you really need to know so you can adjust your pattern as needed. So much easier than using a calculator! so for example: If I am knitting a fair isle chart, would I input my chart repeat and then add the beginning and ending row stitches?